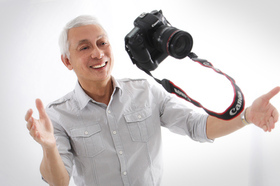 Garry and Shirley have been in professional photography since 2006. We almost stumbled into family photography, although in hindsight it was probably destiny! Garry always loved photography since young, and he vividly remembers winding his old film camera and laying outside in the grass waiting for the perfect exposure. Shirley too remembers him developing his own photos in a makeshift darkroom, fiddling with the chemical process until the photos turned out just right. Between those early days and now, we actually worked in fields which are cousins to photography such as graphic design and printing. But one day the opportunity to try something a little different arose, and although building a photography business in the age of smartphone cameras was never easy, we finally managed to find a way to pursue this art in a way that felt true to us. Since the early days of Picture Moments, we have made it our mission to create beautiful yet simple photography that leaves our customers delighted. Nothing brings us greater joy than seeing the smiles, and occasionally tears, of a family seeing their images for the first time. We specialise in family, newborn, pet and wedding photography, making use of both a studio and the great outdoors. Our photography is light on props because we know everyone shines in their own way, whether it’s a subtle energy or bursting emotion. We helped pioneer the Australian market for pet photography, and to this day furry members of the family remain our favourite and most cutting-edge art. Whether you have dogs, cats, birds (or snakes! ), we’ll work with you and them to create some unbelievable compositions. We look forward to continuing our journey with the ever-evolving art of photography. While new mediums, technology and trends emerge every day, photography will always be a timeless joy that brings memories to life.